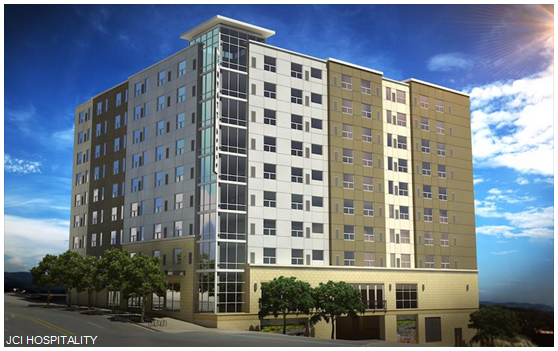 ​​​AUSTIN - JCI Hospitality LLC, an Austin company, broke ground on a Hyatt House Hotel at 901 Neches St. The Hyatt House Hotel is projected to deliver 190 rooms by the end of 2016. The location will serve visitors to the State Capitol and be a straight shot down Red River St. from the Dell Medical School when it opens next year. How many more new hotel rooms can Downtown Austin absorb? Developers apparently believe more are warranted. A 32-story, dual hotel tower at Congress Ave. and Seventh St. that will operate as Aloft Austin Downtown and Element Austin Downtown. That project is slated to deliver 422 total room under the two brands and has a completion date set for mid-2017. Hotel Van Zandt, a Kimpton Hotel, which will open in the next few weeks in the Rainey St. District on the southeast edge of downtown with more than 300 rooms. Fairmont Austin Hotel, a 37-story hotel that has been under construction for almost a year, and will deliver more than 1,000 rooms in 2017.